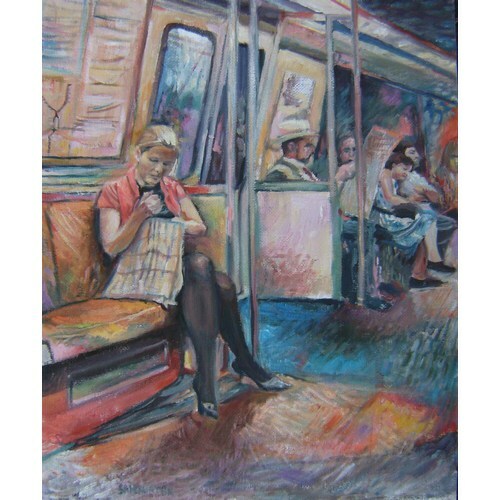 Her first sentence read as following; “She was sitting on the train going into the city.” What a redundant line she thought to herself holding her finger on the delete button and electrically evaporating the sentence far more quickly than it had taken her to create it. How else would one be on a train going into the city? Upside down? Furthermore thinking to her own self? How else does one think if not to their self? She felt relieved to know she had a completed writing assignment lying on her lap that was sealed and ready for delivery. Holding the envelope in one hand and tapping with her fingers on it with the other, her mind began to race and she felt the heat rising up her neck and out onto her face. Intuitively reaching out and touching the cool glass of the train window to calm down she closed her eyes while taking a long deep breath. Slowly releasing it she felt herself back in control once again. Once sufficiently calmed she began to review all that she had accomplished; checking each class and assignment off her mental list as if she might a grocery item in need of purchase. A short lived sense of pride replaced the panicky feeling which just as quickly gave way to her ever present feeling of doubt she could finish. After all there were her two jobs, life’s demands and the question she asked every day; was this worth it? She had been encouraged from the beginning and everyone that had offered to help her was still in her corner. But the most important thing, this girl sitting on the train going into the city had discovered, was that if she wanted it, nothing was going to stand in her way.